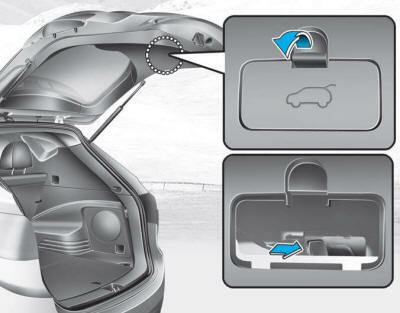 Your vehicle is equipped with an Emergency Tailgate Safety Release lever located inside on the bottom of the tailgate. When someone is inadvertently locked in the luggage compartment, the tailgate can be opened by moving the lever in the direction of the arrow and pushing the tailgate open. You and your passengers must be aware of the location of the Emergency Tailgate Safety Release lever in this vehicle and how to open the tailgate in case you are accidentally locked in the luggage compartment. NEVER allow anyone to occupy the luggage compartment of the vehicle at any time. If the tailgate is partially or totally latched and the person is unable to get out, serious injury or death could occur due to lack of ventilation, exhaust fumes and rapid heat build-up, or because of exposure to cold weather conditions. The luggage compartment is also a highly dangerous location in the event of a crash because it is not a protected occupant space but is a part of the vehicle’s crush zone. Your vehicle should be kept locked and the key should be kept out of the reach of children. Parents should teach their children about the dangers of playing in the luggage compartment. Use the release lever for emergencies only.